This is copied from the interwebbers. And it uses really bad language. So fair warning. But if you can get past that, I promise you will roll with laughter. 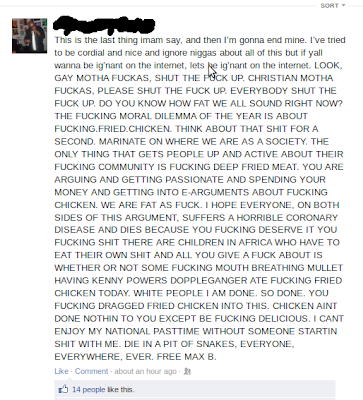 I don't think anyone in my life doubts where I stand on the Great Chicken Debate of '12. I completely dig love and equality and freedoms. 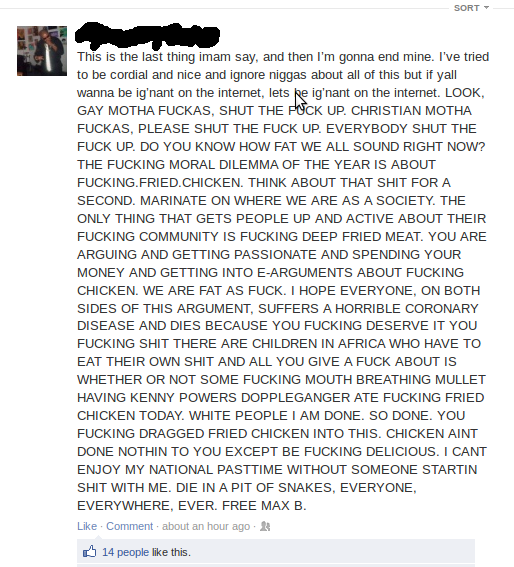 But you can totally disagree and still think this is the most hilarious thing you've ever read. OMG. Hilarius. It does make us look like fat Fs. Ha. Hahahaha I love it! Seriously... I've kept my mouth shut on the "issue" because we all just look stupider and stupider by the day. Pretty sure there are bigger things to lose sleep over. Totally agree - I'm so over the whole thing. Just get over it....everyone!